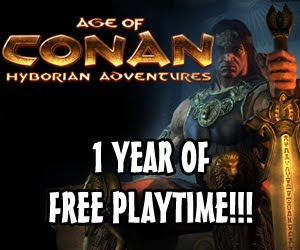 Age of Conan Giveaway: 1 Year of Free Playtime! 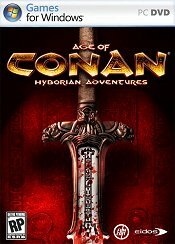 GiveawayGamer.com in collaboration with our brother sites (FreeMMOGamer.com, MMORPGate.com) and Funcom have teamed up to give our users the great opportunity to win 1 year of free playtime for Age of Conan Hyborian Adventures! And that´s not all, the winner will receive more tons of cool virtual items such as the Mammoth, Rhino and Horse mount! To win this amazing prize all you have to do is to share this giveaway or the GiveawayGamer.com site with the world. Tell all your friends, share the link in your twitter, facebook, myspace, forums, websites, make a youtube video, etc. You are free to be creative and do whatever you want. And then tell us what you did, where you shared the links and to whom, if possible take some screenshots, photos or videos. Send your answers to admin@giveawaygamer.com with the subject “Age of Conan”. Don’t forget to mention your name and a valid email. The giveaway will run from November 18 to December 18. The winner will be published during the following days in this post and via email, so please check your mailbox. And the winner is John Humphrey, congratulations! I am not sure to what extent would be too much or not enough. As suggested in the article announced on the Age of Conan Community site, I started with recommending your contest to ALL of my linked friends on MySpace, Facebook, and Twitter. I was also recently accepted as an Age of Conan Correspondent on MMORPG.com; this is now a volunteer position as MMORPG cannot afford to reimburse their correspondents or pay for game account membership as advertised. I continue to submit articles encouraging more players to play, or try out, Age of Conan, since I really love the game. I have shared an article that I submitted to MMORPG as an additional item. In the article I submitted, the info relating to your contest shown in the attached Word2007 copy was editted/cut out of my article and not in the final published MMORPG posting. Whereas each article now has a General Forum thread, I went ahead and added your contest as one of the thread comments posted by my account. My article was also recognized today by the Age of Conan Community site asking its readers to check out my article on MMORPG.com. So how many people could potentially see my promotion of your contest? It is hard to tell... All of my friends on my social networking pages will have gotten an announcement and may read it. Anyone that queries the keyword search tool for "contest" or "Age of Conan" may also pick it up on MySpace, Facebook, and Twitter. MMORPG suggests that they have 500,000 readers that read correspondent articles, and some of those will look forward into the Linked Forum Thread to see how folks are commenting where they will read about your contest. Two days ago, an email went out to the MMORPG subscriber base announcing my Age of Conan Article. In addition, many others who have already read the forum thread get an e-mail announcing any further contributions to that "watched thread", including the thread entry that I posted concerning your "Age of Conan" contest. I sent Twitter posts (Tweets) to "Silirrion" (Craig Morrison) and "Funcom_Conan" (Age of Conan Community) letting them know of my published article. Today that article was announced in the Age of Conan Community Page, so anyone that regularly checks announcements on this page may be drawn to my article and further drawn into the related and linked Forum thread. The webpage URLs for each of these web postings are shown in my JPG Screen Captures for each shared image if you desire to dig a little deeper. I hope this meets your desires, and I hope that I am considered for your contest. A year of Playtime would be much appreciated as I love the game, and I have a wife and four small shildren that would like for me to have one less expense for the next year. Not to mention, the Virtual Item Mounts (Rhino, Mammoth, and Horse) were not included when I bought my Collector's Edition in September 2008; I would love to be able to use those with my avatars in-game. Thank you for your consideration.